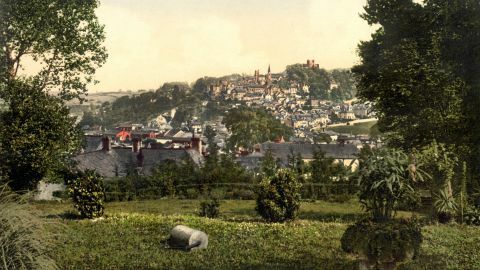 A large mining town in West Cornwall, near the sea, with several important mines round it in the granite, producing tin, copper, nickel, with clay, and china stone, for the Staffordshire potteries. Good building stone is also quarried. Graw or stratum is the most valuable product, found in round, masses, and smelted in the neighbourhood. The chief mines are Polgooth, Crinnis, Pentewan, &c.; there are only one or two of copper. Tram rails have been made to the little harbour of Pentewan,. and Charlestown, in the bay, to ship the ores. Among the buildings are several chapels, a stannary (or tin) halL and an ancient stone church with a good tower, on which, and over the south porch of the church, are various carvings. Population, 3,825. The tin mines which were worked in Cornwall by the roving Phoenicians long before Christ, yield here, and at St. Agnes, &c., about 5,000 tons, worth £70 a ton, yearly. Copper, now the staple article of the county, used to be thrown aside by the tinners, till the beginning of the last century. Polgooth, a tin mine, two miles south-west, in a barren spot, is now almost worked out; formerly it was worth £20,000 a year. It is 120 fathoms deep. Crinnis, which was worth between £80,000 or £90,000, is still very productive in copper. At Carclaze the tin is worked in the light granite of the downs, by lateral shafts, open to the day. Hensbarrow, three miles north, is one of the loftiest of the Cornish Downst 1,029 feet high. Near. Charlestown on the bay, is Duyorth, a seat belonging to the Rashleighs, of Menabilley. It is well planted. Penrice is another seat, in a sheltered spot, favourable for cultivation. 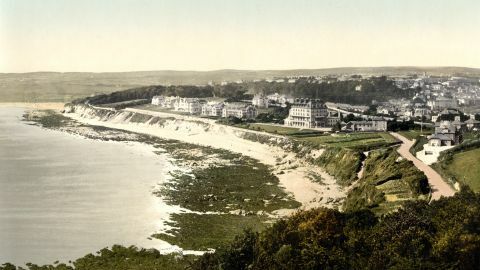 Further down the coast is Megavissy, an important fishing town in the pilchard season, but so filthy, that it is a very hot-bed of disease when the cholera is abroad. In 1849, its ravages were so great that the population were turned out to camp it under tents, while their houses were being cleaned and sweetened. Till lately pilchards paid tithe to the vicar They are caught by the seine or net Heligan, near this, belongs to the Trernaynes. 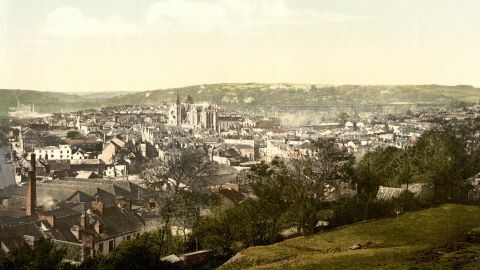 Truro, the mining capital of Cornwall, and a parliamentary borough. It is now the principal coinage town in the Duchy, where the metal is stamped, previous to being exported.